A Chorus Line: "How Are You?" My life has been turned inside out, upside down, around & around. Today I visited the Kariabungi Slum, my first visit to the slums on this journey of a lifetime. Our visit to the slum started with transportation via two Matatus “Minibuses”. The first of the two was stripped inside of nothing but 9 seats & the front bench seat accommodating 2 passengers. Small holes to the road below & exposed body of the car throughout the vehicle were among many of its charms. We transferred buses, after a walk downtown, which was risky in & of itself. Next, we boarded a larger matatu, complete with a conductor & all. By conductor, I mean a man standing outside of the bus yelling its destination & pounding on the side of the bus. In time, the fluorescent green matatu began moving & we were off to Kariabungi. The conductor was amazing as I hopped out of the matatu like a pro… But I didn’t see it any other way. Lisa was on land, while our Rafikis “Friends” were still in the vehicle. In Nairobi, Matatus don’t necessarily stop… ever. Nevermind the absence of traffics lights, there are hardly any designated bus stops. It’s come & go as you please, even in the midst of traffic. Following my leap of faith, we continued walking through the Kariabungi Market as we made our way to Wanji’s home. I began to feel heavy again, as I was faced with the realities of walking through a slum, as opposed to seeing them in a distance. It wasn’t until I heard a sweet chorus that my heart lifted & the world as I knew it changed forever. Imagine hearing “How are you? How are you? How are you?” from the tiniest voices, reaching from behind doors, between ally-ways, at your feet, up on roof-tops (literally) & balconies. 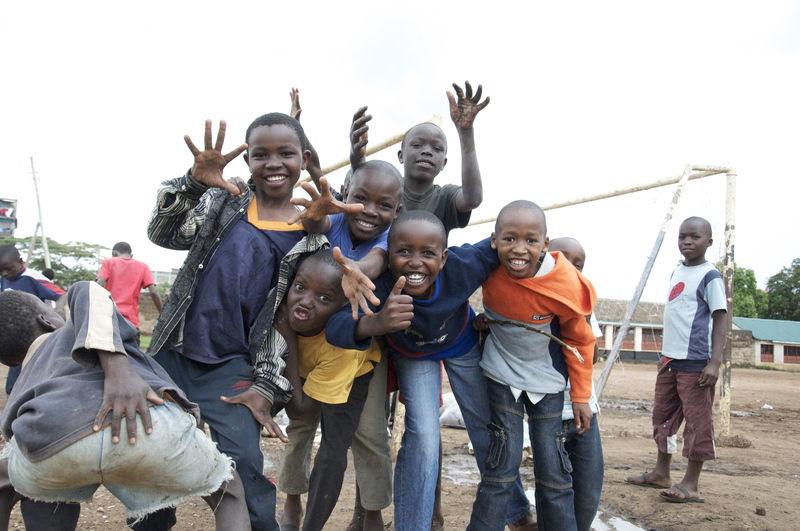 The sweet, sweet Children of Karibungi!!! They were there in abundance and thrilled to greet Lisa & I, the Mzungus “White People” (Formally, people of Foreign Descent). The celebrities were in town & each & every one of the children were reaching their hands out to us for a Gota “Greeting” (Super informally, “Fist-pump”). Words & pictures can not describe the smiles of these children. My heaviness completely lifted as I realized the oneness of us all through the universal language of a simple smile… Actually, hundreds of simple smiles. We arrived at Wanji’s home, after taking a flight of stairs never seen by the light of day. Lisa & I were graciously welcomed as we met Wanji’s neighbors & friends. We walked to the balcony to observe life in the slums from above. Catherine shared the intricacies of life In Kariabungi. Despite conditions you can’t imagine, the smiles & the joys expressed from all generations place unimaginable joy in your heart. Wanji, Sandra (age 6), Adelheid (age 7), & Irene walked us through more of Kariabungi. We passed the community center, a large building with broken windows & just enough coverage to host yoga classes, & through the soccer field where we were greeted my the most cheerful boys I’ve met thus far. Pictures & poses summed up the followed 10 minutes, as each & every one of them hammed it up for the camera! A local young man, Steve, took quite a liking to me with hardly knowing my name. “Are you single?”, he asked “Because I am”! People certainly have no fear in speaking their minds here, or in connecting through eye contact. I love them for it. We passed though a larger street, as the chorus of “How are you?”s, seemed to grow louder & louder. With each little question my heart became more & more full. The sweetness alone in greeting us with “How are you?” vs. “Mambo”, “Sa-sa” or “Hello” made me smile more than you can believe. Imagine living & knowing no life other than that of the slum. Imagine the happiness & joy that can be created by such innocence. There is such beauty & possibility visible through the smiles on the faces of these unforgettable faces. We arrived back to Wanji’s home just as the heavens really opened up, but alas it is a blessing to be rained on according to the locals. Then, the fun really began. Scarlett, age 3, greeted us after waking from her nap. According to Wanji & Esther, this little young one has to be told that she will get to visit “White people” in order to get her to eat. She was thrilled to see us, though with a language barrier, we decided dance was the best form of communication. The afternoon was spent dancing, singing & watching the sweet kids perform the minutes away. I’m telling you, I think I found heaven on earth. My cheeks were aching & I’m almost certain my dimple (yes, I only have one) doubled in size… I could not contain my smile. Then sweet baby Tully (age 1.5), daughter of AYP teachers Patrick & Catherine, came to visit us. I instantly scooped her up from Irene’s arms & held her on my lap as we continued to watch the performances. My heart strings pulled when Wanji & Irene came back to take us to the cab that would return us back to the Westlands. I was so sad to be leaving so many tiny, beautiful souls full of immeasurable joy & possibility. I rest assured knowing that I will be able to visit these little ones again on Wednesday, along with hundreds of other little ones at AYP’s outreach programs this week. My life will never be the same, as the simplest phrase, “How are you?” has taken on a meaning larger than I ever could have dreamed. From China Free Shipping, NHL Jerseys, NBA Jerseys, Titus Davis Jersey From factory.